20-Rep Squat Routine: Variations & Benefits! Most people don't like normal squats, let alone some mutant variation for 20 reps! In this article I'll touch on the history, give you some examples of early routines and give you a routine to follow based on this exercise. The 20 rep squat is also known as breathing squats, having its origin dating back to 1930. This routine is going to do a lot to promote not only leg growth but also overall growth. Spend 6-8 weeks on this type of routine before switching back to something else. The 20 rep squat is without a doubt one of, if not the, most demanding exercises you can do. You will definitely know what pain is all about after one set of these! It also is not all that common anymore. Why? Who knows. Maybe it&apos;s just too tough. Most people don&apos;t like normal squats, let alone some mutant variation for 20 reps! In this article, I&apos;ll touch on the history of this great exercise, give you some examples of early routines and give you a routine to follow based on this exercise. Of The Most Demanding Exercises You Can Do. The 20 rep squat is also known as "breathing squats," having its origin dating back to 1930. This was a simple, 4-5 exercise full body routine based around squats - but not yet 20 rep squats. J.C. Hise is perhaps the most dramatic example of this routine, having great success with it. Peary Rader, founder of Ironman Magazine, with the help of people like Hise, is generally credited with coming up with the first 20 rep, breathing style squat routine. Breathing squats for those who don&apos;t know, are squats done for 20 reps with a weight you usually do 10 reps with, each time you hit failure, you take 3-5 deep breaths and continue until you get to 20. Quite a simple routine that came along with a "formula for growth." Now, much of the "formula" to this program, is the idea of doing the breathing squats, eating a lot of food and drinking a lot of whole milk. This is, in fact, how this routine is defined by most proponents, including a book claiming you can gain 30 lbs of muscle following this routine. So you see how these early routines were set up, very basic full body routines, done three times a week. Most current variations of this exercise include it on leg day as part of a split routine. While I can see value in full body style routines, I think a split routine is the only way to go for a serious bodybuilder. I also believe this exercise, when added to a good split routine, will add considerable muscle. I think modern supplement standards have moved us out of the "whole milk" days, so a good supplement stack will really enhance this exercise&apos;s effectiveness. Way To Go For A Serious Bodybuilder. This would be a good time to review the proper performance of this exercise: Pick a weight you would usually fail with at about 10 reps. At failure, pause and take several deep breaths, continue doing as many reps as you can, maybe one, maybe two is all you&apos;ll get. Pause again, take 3-5 deep breaths, and go again. Keep doing this until you hit twenty reps. Make no mistake, this ain&apos;t easy, and you will want to quit before you hit twenty, but keep going. This is as much mental as it is anything else. If you&apos;ve done the set correctly, you should pretty much hit the floor. If you feel like you can do more, you did something wrong! Once done with your set, crawl over to a flat bench and do a set of light dumbbell pullovers for twenty reps. This is, really, a variation on rest pause style training, which is enjoying new popularity under a variety of training program monikers. Done in this fashion, this exercise is going to do a lot to promote not only leg growth but also overall growth - it&apos;s been said that squats can increase upper body size by 10-15%. Here&apos;s why: squats are known to promote a lot of natural hormone release (igf-1, gh and testosterone) causing over all growth. 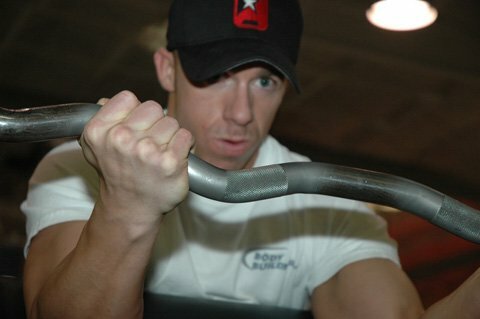 They target the legs like no other exercise but also involve most muscles of the body either directly or indirectly, and the deep breathing combined with pullovers promote rib cage expansion, leading to increased chest size, although this has a lot to do with age: the younger you are, the more pliable your rib-cage is and the more you should be able to expand it. Following is a great routine based around 20 rep squats. I also added two variations to the basic routine. In these variations, the exercises are the same, but the rest days and body part split changes. This gives people with different schedules and lifestyle obligations something to work with. Since 20 rep squats are really a lot like rest pause type training, and are certainly a high intensity technique, we&apos;ll make this routine high intensity. We&apos;ll follow it with a power type routine. I don&apos;t usually talk about rest time between sets but I&apos;ve been getting questions about it - I usually rest no more than one minute, even when lifting heavy, but you have to be able to recover fast enough to warrant this. Some extreme power lifting routines call for up to 5 minutes rest between sets, I think that&apos;s too long. I feel this is a somewhat individual thing, as you have to be recovered enough to do your next set justice, and the time needed to do that can vary depending on your conditioning level among other factors but you also don&apos;t want to start losing your pump and focus. So I suggest no more than 1-3 minutes. If you are new to this type of training, you may want to ease into it by only using rest pause on 1 set of each exercise, and then gradually work up to the recommended sets. Have You Ever Tried A 20 Rep Squat Routine? Episode #13: All About Squatting! In Kane&apos;s thirteenth video episode, Mr. Sumabat performs a variety of squatting variations, including front squats, back squats, and overhead squats. As with all routines, after 4-6 weeks, it&apos;s time for something new. A nice variation to a routine of this type is to switch to a power type routine, lower reps (5), straight sets, heavy weights and basic movements. Regarding rest time between sets - some people like to rest 2-3 minutes on a power routine to enhance between set recovery for more strength on there next set. I have always set my split routines up this way - legs on there own day since they require a lot of energy and are very taxing to train, "pushing" muscles on there own day and "pulling" muscles on there own day. This is logical as these muscles naturally work together. However, to mix things up, it&apos;s not a bad idea to change up the order of body parts. If you want to add a fourth training day, training delts on there own day is another good option. Spend 6-8 weeks on this type of routine before switching back to something else. It&apos;s a good idea to have 3-5 good but different routines to use in an on going cycle like this, rotating each one after 6-8 weeks. This helps keep variety in your training and promotes continued progress. I have trained thousands of athletes how to squat properly and some of those basic techniques are going to be outlined in this article. In the article below we will discuss the legs, its function, and some exercises for it. This guide includes 5 workout programs. Marcus Haley uses predatory skills to blast his legs into oblivion! See how the beast trains.